I'm doing a chevron quilt right now, and hadn't really thought much about how I'm going to quilt it. You can always do an all over meander, or stitch in the ditch along each V, or, hmm, lots of different things you could do depending upon your quilting expertise. I don't really have much expertise since I'm no longer able to hand quilt due to shoulder injuries. I'll probably machine meander. 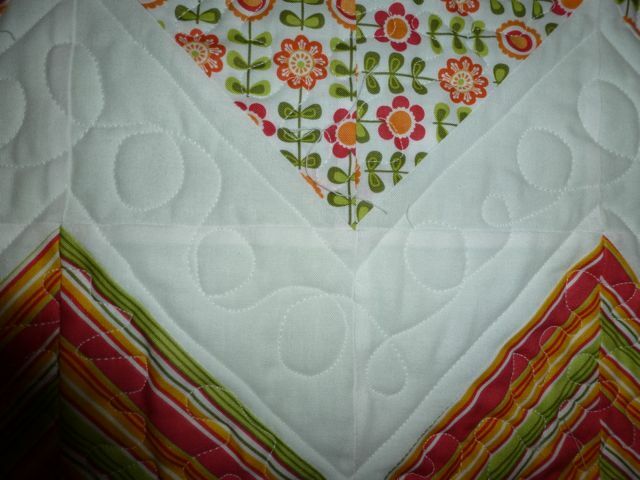 I think it would look nice with echo quilting in the v shape. I don't want to brag but I can still fit into the earrings I wore in high school. 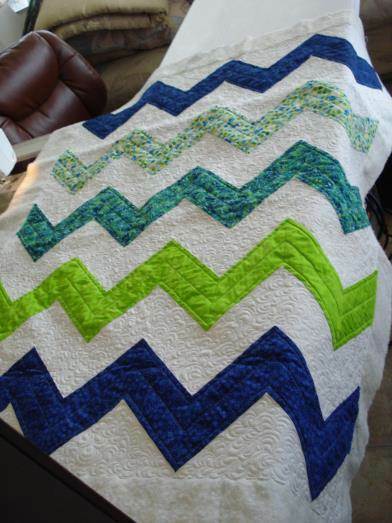 Love this one, even though it is not a chevron pattern, the quilting is. I just finished one. I did an all over meandering stars pattern. It looks adorable on the back (polar fleece) but I don't like how it turned out on the front. In hind sight, I wish I'd done a geometric pattern so the whites really popped. After I washed it, it just looks scrunchy, but not in a uniform way. I should add however that I struggled with the fleece. It was either too stretchy or too tight. Operator error no doubt. I recently made 2 chevron quilts. The blue/green one I quilted straight lines in the colored areas and a filler pattern in the white. 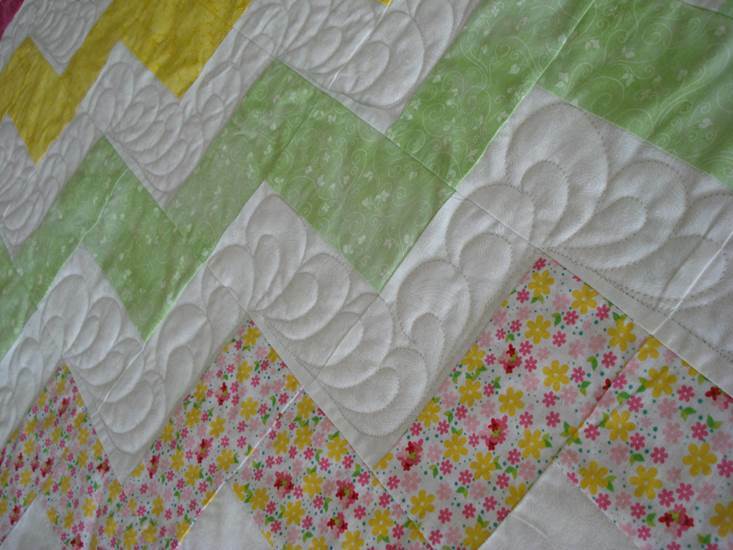 On the pink/yellow one, I quilted feathers in the white and a flower vine in the colored parts. I didn't have a good pic of the flowery vine in the pink one...sorry! It would look great with a stipple, all over design, just about anything. Oh nice job. I just finished one too but Ill have it overall machine quilted. Katier825, your quilts are so nice! Did you do them on a long-arm machine? I've made a couple using this pattern but must confess I haven't been able to fmq it as nicely as she does. Katier825 is really nice, too. I think I never posted it but here is a close up. I first outlined the chevrons with straight stitch, stippled in the print and did loops in the solid white. This is the first one I did. The second one, I did the same except I used the loops in the prints, too. That one actually is nicer as I began to get the "hang" of it. Last edited by sparkys_mom; 05-25-2013 at 03:51 AM. Stay with this board and you will always find an answer or idea. Very nice ideas - I like all the suggestions offered here - They help me think out of the box. Oh Sparky's Mom, I think your's is really nice, too! So glad someone asked this question because I'm finishing up just such a quilt and was at a loss as to how to quilt it. Now, if I only could do one half the great job you ladies on the Board do.